A werewolf is a human being who turns into a wolf and later resumes human form. During their episodes as wolves, werewolves savagely attack, kill, and devour animals and people. The word “werewolf,” or “man-wolf,” was ﬁrst recorded in Old English the 11th century in the Ecclesiastical Ordinances of King Cnut (1017–1037). It was sometimes used to refer to outlaws. Werewolf lore has existed since antiquity. Early humans may have established strong bonds with wolves—from whom dogs evolved—and there is evidence of various animal cults, in which humans acquired animal powers by donning their skins. The BERSERKIR and EIGI EINHAMIR are examples of later animal cults. Early humans may also have practiced cannibalism. In the earliest religions, gods and goddesses had animal attributes. In ancient Egypt, the images of gods were as were-animals: human bodies with animal heads. Legends and myths of human transformation into wolves—one of the most feared of all animals—are thousands of years old. The wolf is prominent in Greek stories and in Norse, Scandinavian, Icelandic, and Teutonic lore (see SHAPE-SHIFTING). In some legends, the werewolf is a person born under that curse, who cannot prevent himself from his hellish metamorphosis, which happens on nights of the full MOON. The person, usually a man, but also a woman or a child, acquires the shape of a wolf and all its attributes, and roams about the countryside attacking and eating victims. In other tales, the werewolf is a witch who accomplishes the transformation by magical means or with the aid of DEMONS. Werewolf superstitions may have some basis in lingering practices of primitive cannibalism. As others became more civilized, those who still liked to eat human flesh were increasingly ostracized and demonized. Werewolf beliefs were particularly strong in parts of Europe where wolves were common and presented dangers. Superstitions and fears of wolves ran high in the Baltic regions (Livonia, Latvia, and Lithuania), France, Germany, Switzerland, and even parts of Spain. Plague epidemics that decimated local populations enabled wolves to ﬂourish. As they lost natural prey to hunters, they turned to livestock, pets, and even humans, though attacks on humans are rare. France was particularly plagued with wolf terrors, the greatest of which was the BEAST OF GEVAUDAN. In England, wolves were exterminated by the 16th century, and so fear of wolves—and consequently stories of werewolves—are less common than in other parts of Europe. Werewolf sightings and encounters continue into modern times, and mingle with reports of other mysterious creatures such as Bigfoot, CHUPACABRAS, DOGMEN, and the Skunk Ape, as well as with reports of UFO activity (see EXTRATERRESTRIALS). The BEAST OF BRAY ROAD has had numerous sightings and close encounters in Wisconsin. Whether the werewolves actually live in the physical world or are part of some parallel world that occasionally and temporarily becomes accessible has been debated by researchers. Some encounters seem more like ghosts, suggesting a parallel world or dimension. ELLIOTT O’DONNELL recorded a case of an apparent werewolf phantom, told to him by the young woman who had the experience. Jean St. Denis was staying at a small farm in Merionethshire, Wales. She would go to the railway station platform to do her sketching. One evening at dusk as she was packing up her equipment, she noticed an odd and indistinct ﬁgure sitting on a truck nearby. The ﬁgure seemed to be staring at her. At the same time, she became acutely aware that the station was deserted, save for her and the figure, whom she took to be a man. She asked it the time, but it gave no response. St. Denis quickly ﬁnished packing and departed. She had to walk to the farm alone in the growing darkness. Along the way, she realized she was being followed. Looking over her shoulder, she could see the strange ﬁgure behind her. With the loneliest and darkest stretch of road ahead of her, she decided to confront it. She was horriﬁed to see that her pursuer was part man and part wolf. It had a naked, gray, man-like body and a hideous wolf’s head with blazing eyes. When she turned her ﬂashlight into its face, it pulled back and put its paw-like hands in front of its eyes. The ﬁgure then faded completely away, like a ghost. O’Donnell relates another werewolf “ghost” case from the Valley of the Doones in Exmoor. A woman walking home alone late one night suddenly saw in front of her a tall gray man with a wolf’s head, stalking a terriﬁed rabbit that was frozen still. Just as the werewolf seemed ready to spring, a stag burst out of the brush and startled it, and the ﬁgure abruptly vanished. More recently, the British parapsychologist Robin Furman reported a phantom werewolf encounter in his home in Grimsby, England. When his daughter complained of a strange, apparitional ﬁgure watching her from her bedroom door, Furman switched rooms with her. Once in the room, he felt that he was not alone, and then noticed the ﬁgure of a tall wolf-headed man looking in through the doorway. The form faded and then disappeared. Furman felt no hostility or evilness from the ﬁgure, but thought that it was more looking at him out of curiosity. The ﬁgure was never seen again. Phantom werewolves angrily looking for their missing bones have been reported, as in the HEBRIDES WEREWOLF and MERIONETHSHIRE WEREWOLF cases. A demonic phantom werewolf manifested in conjunction with the discovery of the stone HEXHAM HEADS in Northumberland, England in 1972. In the 15th and 16th centuries, the Inquisition was at its peak. Werewolves, like witches, were seen as servants of the devil, and trials of accused witch werewolves increased. The cases were characterized by murder and cannibalism. In Europe people accused of shape-shifting and other acts of witchcraft were burned. In the Pyrenees alone, some 200 men and women “werewolves” were sent to their deaths. Demonologists accepted werewolves, but most believed them to be delusional with the aid of the devil, or simply delusional. King James I of England (King James VI of Scotland) wrote in his Demonology (1597) that werewolves, or “ManWoolfes,” were not people under the influence of the devil, but suffered from delusions and melancholia, and imitated wolf behavior. Some accused werewolves clearly were mentally unstable and deranged people (see GRENIER, JEAN and ROULET, JACQUES). In 1541, a deranged farmer in Pavia who murdered several persons was arrested as a werewolf. One of his claims upheld a popular superstition, that werewolves have their wolf pelts on the inside of their human skins. To verify this, the authorities cut off all his limbs. They found no wolf pelt, of course. They accused, now innocent, unfortunately died several days later. In lore there are two general types of werewolves: involuntary and voluntary. The involuntary werewolf is a person cursed, perhaps because of a sin. The curse might last a few years or a lifetime. For example, an Armenian folk belief holds that a sinful woman is condemned to be a werewolf for seven years. A demon appears to her and commands her to don a wolf skin. When she does so, she assumes the nature of a wolf, devouring her children and then strangers, wandering about at night to wreak havoc and returning to human form in the morning. In MONTAGUE SUMMER’s collection of werewolf lore in the British Isles, a self-described werewolf named Calcevayra related that he did his transformations on nights of the full moon. He would go to a distant location, strip off all his clothes and hide them beneath a rock or in a thornbush, and then roll to and fro in the sand until he “rose up in the form of a wolf, raging with a wolf’s ﬁerce appetites.” Calcevayra also said that wolves always run with their mouths open because it helps their speed. If their jaws are closed, they cannot easily unclench their teeth. In addition, there are lycanthropes, sufferers of LYCANTHROPY,which medicine recognizes as a mental and nervous disorder. Lycanthropes exhibit the same characteristics as the werewolves of lore. 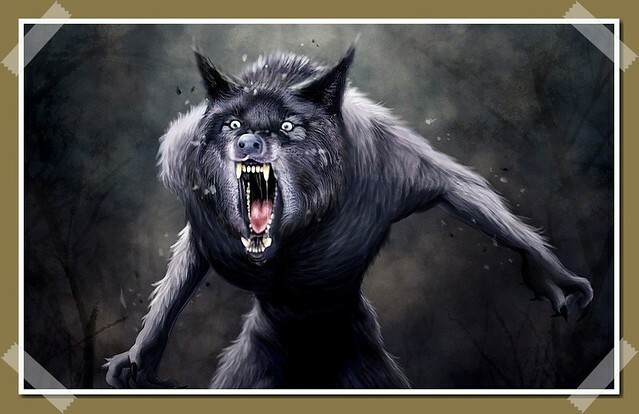 In Slavic lore, the werewolf is closely related to the vampire; the name of the Serbo-Croatian VUKODLAK vampire means “wolf’s hair.” VLOKOSLAK,a Serbian term, and VYRKOLAKA, a Greek term, are among the names that are applied to either a vampire or a werewolf. Many European superstitions about vampires hold that they can shape-shift into various animal forms besides wolves. In Greek and Serbian lore, werewolves are doomed to become vampires after death. See also FORTUNE, DION; MAGNUS, OLAUS. Baring-Gould, Sabine. The Book of Werewolves.London: Smith, Elder & Co., 1865. Downes, Jonathan, and Richard Freeman. “Shug Monkeys and Werewolves: The Search for Dog-Headed Men,” in Fortean Studies Vol. 5, Steve Moore, ed. London: John Brown Publishing, 1998. Noll, Richard. Vampires, Werewolves and Demons. New York: Brunner/Mazel, 1992. O’Donnell, Elliott. Great Ghost Stories. London: Foulsham & Co., 1983. Otten, Charlotte F., ed. A Lycanthropy Reader: Werewolves in Western Culture. New York: Dorset Press, 1989. Sidky, H. Witchcraft, Lycanthropy, Drugs and Disease: An Anthropological Study of the European Witch-Hunts. New York: Peter Lang, 1997. Spence, Lewis. Legends and Romances of Brittany. Mineola, N.Y.: Dover Publications, 1997.